I am attaching my code. Any help would be appreciated. Thanks! I tried the code you attached and I am able to see the gauge. I only added a div to host the gauge control and the call to SetUpGauge when the document is ready. I would recommend you try alert(cfx.gauge.Version); and include the version reported, also if your js files are very old I would recommend downloading updated versions in case it is something that has already been fixed. The alert box says the version is 7.4.5649.31763. I downloaded using the Manage NuGet packages option in Visual Studio. I don't get the error. I know I won't see the gauge without this line. 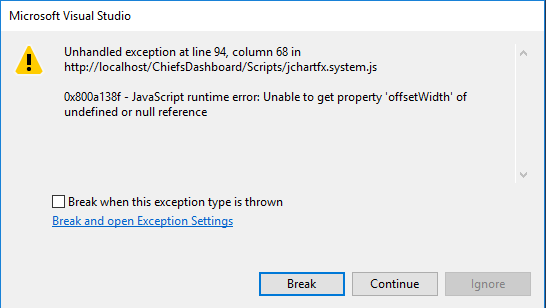 I would recommend making a backup copy of the jChartFX scripts you are using and download the most recent build, the build you are using is from 2015 so there have been several fixes as well as new functionality. You can download it at www.jchartfx.com, I will pass the outdated nuget information so that we can update it.